So what exactly did we do in here? We started with HandyMan building the fireplace frame. This helped determine the position of the pot lights which were installed next. We removed the old wallpaper and uncovered a hidden treasure that turned out to be nothing more than a hole in the wall. Then we had the stuccoed ceiling skim-coated (a change which instantly made the room feel much more modern and new) and painted the room. We found a hutch and a dresser which we spraypainted and updated with new hardware. 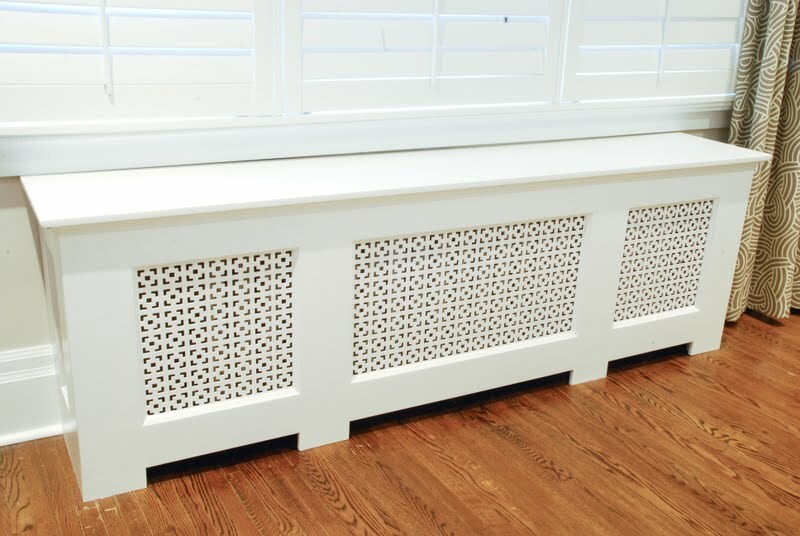 HandyMan built one more of his awesome radiator covers and installed the baseboards. I ordered curtains and practiced my styling skills with the hutch. 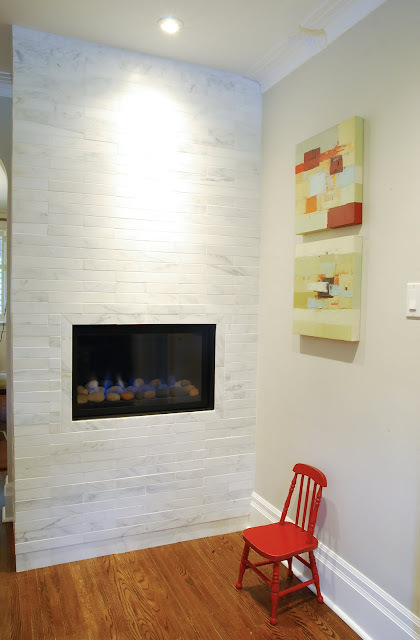 We spent a lot time trying to figure out the tile for the fireplace and it turned out looking great. And finally, we added some new furniture and put it in place like we planned. The room has much more pattern and colour than any other room in the house. The wallpaper in the dining room kind of forced us to also use colour in the living room, but I'm really embracing the look. 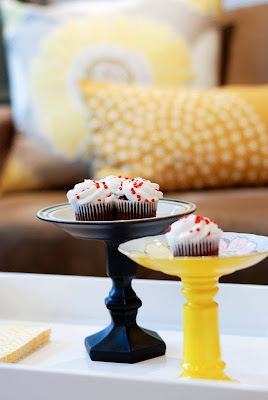 We tried to be a bit bolder in our decorating choices, mixing textures, patterns, and styles. I would have to say this was the hardest room to decorate in our house! We've tried to keep this a room everyone can enjoy so that means that Chloe's toys and books have a place here too. There's one thing left to do which is pretty up the sideboard wall. We need to turn the sideboard into a media cabinet (hence the cable box sitting on top) and I think we'll be painting the sideboard too, to lighten things up on that side of the room. But that's a bigger project for another day. For now, we'll just sit back and enjoy sitting in a finished room. beautiful, beautiful, love it! Do you find you still have enough heat radiating from the rads with the rad covers??? I would love to make covers for ours but am concerned about this. thnks. How did you deal with the old paneling on the walls? Did you rip out and use drywall, mud and sand smooth or something else? I need to know! Love that room! Where did you get the screen used for the radiator cover? I was wondering what color you used for your hutch. perfect room. i love the blown up picture of your daughter. Do you have a printing company that you recommend? And have you already answered where the pillows are from? Your home is so fresh and chic! Love everything from the hutch to the two occasional chairs. I also adore your way of mixing fabrics and patterns. 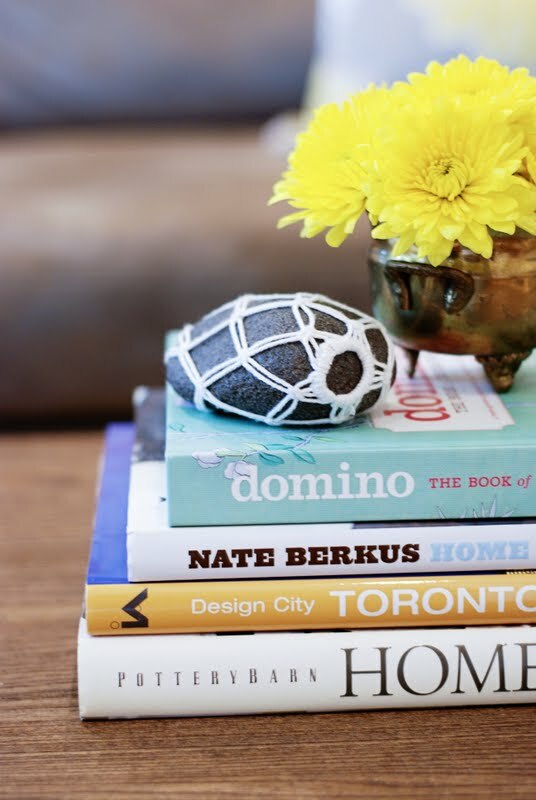 Your bolder decorating choices totally paid off. And the fireplace is absolutely gorgeous. Your husband did a wonderful job! Great blog, a new follower! I thought for a minute I had clicked on the Style at Home blog...but no;) It really is a beautiful room. I hope you are enjoying every minute in it. I'm wondering if you would mind sharing we you got the pillows on the sofa? you did a fantastic job! i would love to get your opinion on my living room as it has a similar layout to yours and I just can't seem to finish it! Oh, it looks so great. I love how you tied in the yellow in both rooms. Fantastic job!!! Where did you get the chairs? I loooooveeee them. Jen, I love it!!! 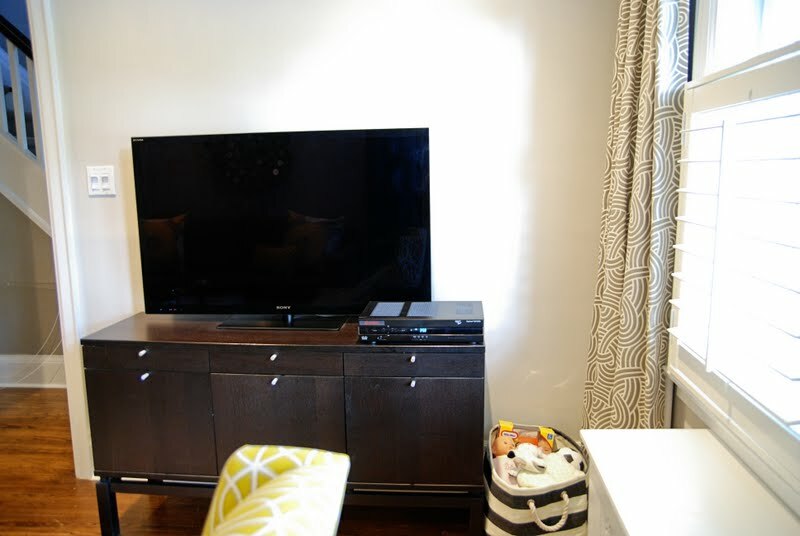 You and Handyman did such an awesome job in this room!! Where do I start? 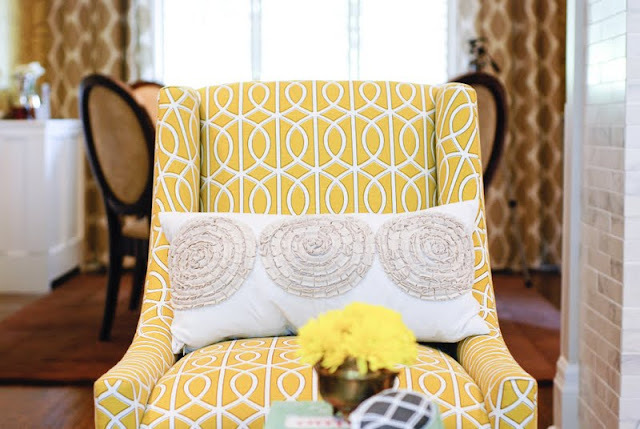 Love the patterned fabrics you chose for the chairs and the Tonic curtains! Great colour choice for the cabinet & hutch combo! Of course the fireplace is perfection! And I love the rug you chose, it's gorgeous! Congrats on having it done - now enjoy!! Beauty. Just wondering where you got the coffee table? (I'm in the GTA as well...). Thanks!! I was so excited to finally see this and seriously, you guys rock my world! I love absolutely everything! It flows perfectly with the dining room yet has it's own personality! Well done! This room is simply gorgeous. 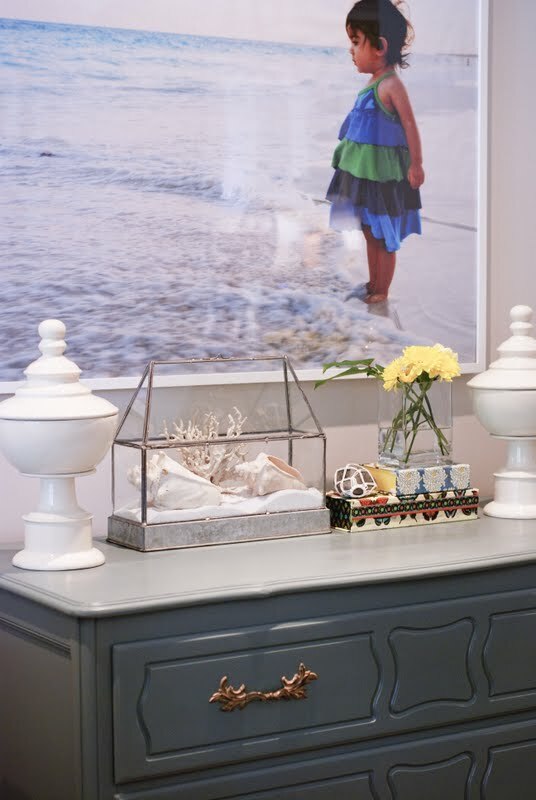 There are so many elements I just love - the colour palette, the C&B chairs, the painted hutch and dresser, the blown up photo of your daughter, and the placement of your television (like how it's hidden when you walk into the room from your front hall). Superb job! you should be so proud. Wow. Wow, wow, wow. I LOVE it Jen. Those yellow chairs are amazing, but little red chair is what kills me! :) The photos are great too - did you take them yourself? So, so good. In my imagination, I am heading over right now to watch Million Dollar Decorators with you, with my feet up and the fire on. How many yards did you have to buy for the curtain? How long are yours? Thanks!! You are so good!!! I love those Crate and Barrell chairs! I was wanting to buy them but I thought they could go out of style. What do you think? Will they last a good while? Gorgeous!! Please let us know where you got those chairs, they are exactly the style I've been looking for! Jen!! It's SO lovely! I can't even begin to pick my favourite element. 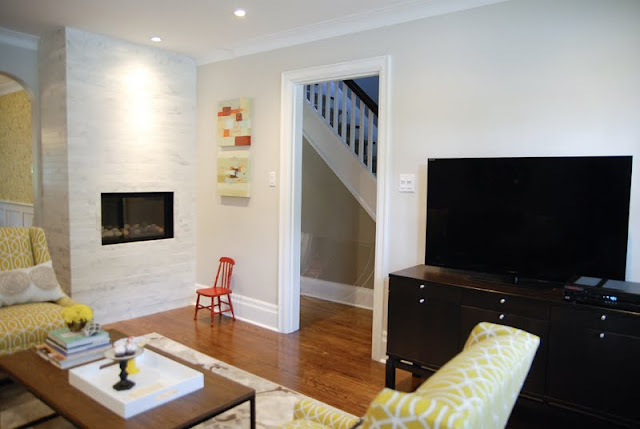 Everything ties together so nicely, the colour palette, the layout, that GORGEOUS fireplace! Amazing job. Please share where you purchased those chairs. They are flipping perfect for this room! Fabulous! This is totally inspiring! Pot lights really make a lot of difference. Sad to say, it's almost impossible to install pot lights on condo units. Would you know any alternative? wow Jen! ... WOW!! you have outdone yourself!! Where do I begin? I love how the two vintage units now tie in perfectly together with a coat of paint (love the smokey blue by the way), the pair of chairs from C&B in dwell fabric, your custom drapes by Tonic Living, the tiles on the fireplace (so stylish and sophisticated, esp with the subtle frame around the fireplace), your pillows, and how the two rooms connect so nicely with one another!! Now i have to ask you where you got those lovely art work next to the fireplace, the industrial coffee table (homesense?) and that lovely area rug!! I was also on the hunt of the west elm drapes you have in your dining room but can't find it anymore!! thanks so much for sharing the transformation with us.. . it is an inspiration!! Love the room! Everything is perfect! What is the name of the coffee table? I have been looking for one exactly like it! The coffee table was the last thing we bought and it really brought the room together! Its from Urban Barn. Wowie!! It looks incredible, Jen. You guys did a fabulous job! I love how it isn't matchy matchy but works with the rest of the house. I especially love the fireplace and the coffee table. It looks so beautiful Jen!!! It ties so well to the gorgeous dining room (which I've always loved). I'd have to say my favourite are the two chairs. Love that pattern. Enjoy your hard work! I love the living room! I think you two did an amazing job. 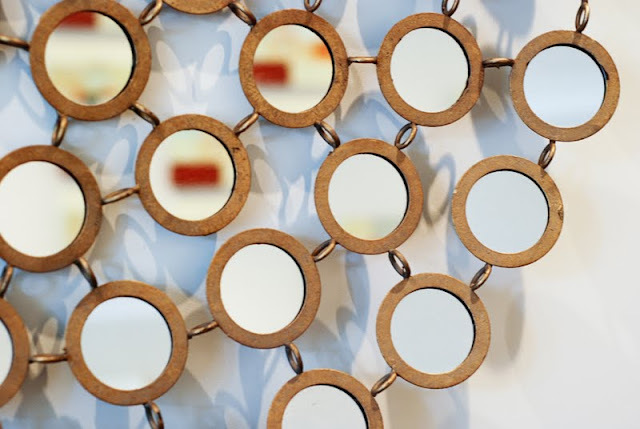 I love, love, love the mirror. Where did you get it? I am speechless over here. That is totally perfect. You did an AMAZING job. Congratulations. It looks so beautiful! 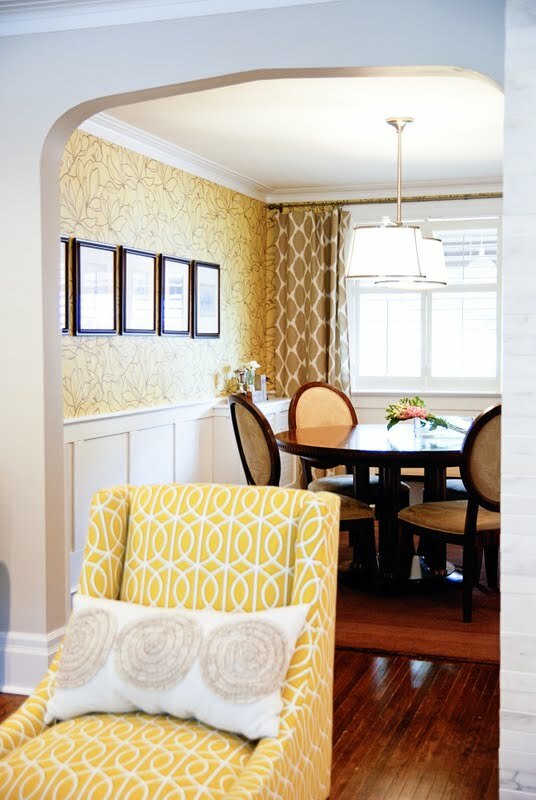 I love the flow between the dining and living rooms and the fabrics you chose. It also feels done, but accessible so it's not so perfect that you can't put your feet up and relax. Well done! OH my gosh!!! I have anxiously been awaiting the final reveal, and let me say, it was SO worth the wait. I love the color scheme, the fireplace, all of it! You did an amazing job pulling together a coordinated but interesting room. Love it! I love the curtains. Where are they from? I assume that you are a professional painter. Very nice and creative. 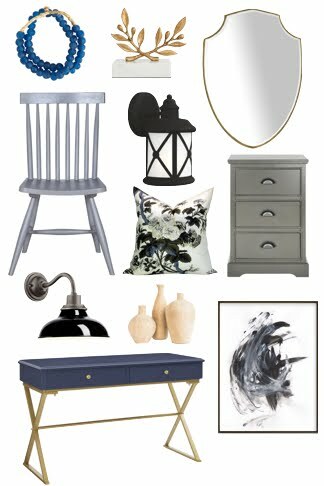 Still just want to share my thoughts though.In the home, interior paint colors are the cheapest way to accent, style, dramatize, and personalize a certain area. Interior paint can be used to hide a certain flaw or dramatically change a room in the home. It might look like paneling, but that was actually wallpaper in the 'before' photo. Sorry I can't help! beautiful design aesthetic! well done. My wife and I love what you have done with this living room - great job! What a transformation! Great job! Wow I am speechless! What a transformation! LOVE everything you've done to this room: excellent combination of colors and patterns, attention to details and accent pieces. I am sure this deserves to be featured in any major home reno magazine. Nice job again! Love it! Just started following and your design style is great. Thanks for sharing and Happy New Year to all!!! Gorgeous! What talent! 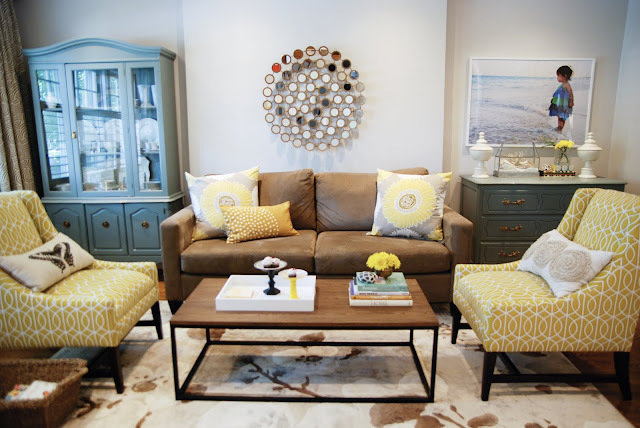 I love the area rug that pulls everything beautifully together! I have been looking for the area rug and I think I have found it but I have to oder it in and want to make sure it's the right one. Would it be model # 63222 Crystal ? (alexian carpet) Thanks! We actually recycled the old screen from the radiator cover that was in the house when we bought it. The chairs are the Chloe chairs from Crate & Barrel. The chairs came upholsterd in the Dwell Studio fabric. The paint on the hutch is Schoolhouse Slate by Martha Stewart. There is a slight noticeable variation in heat from some of our rads but I'm not entirely sure if that problem was already there before or not. One of our rads at the top floor just never seems to get really hot, even if we bleed the air out of it, so we've had to create a way to prop up the lid so more heat gets out. what an amazing transformation! love what you do! i especially like the painted furniture! Lovely! A good mix of patterns and colours, modern yet warm. The rug is stunning! Yay! So happy to see the "afters," and I know y'all are relieved to be finished! It's FABULOUS!!! It must feel great to complete such an amazing room. Love the chairs with the Dwell Studio fabric, and my favorite part has to be the big Chloe pic. Well done! It is absolutely stunning! You guys did it again! P.S. I can comment, now! Yay! It looks amazing! You must be so happy to be in the finished room. I think the touches of yellow are perfect and will work equally well in the summer and dreary winter months. Congratulations! The photo of my daughter wasn't professionally printed; my husband just printed it on his large scale office printer. I can't recommend a printing company unfortunately but I have heard good things about posterjack.ca. The large sofa pillows were from HomeSense, the yellow one from West Elm, the circle ruffle pillow and the butterfly pillows were also from HomeSense. 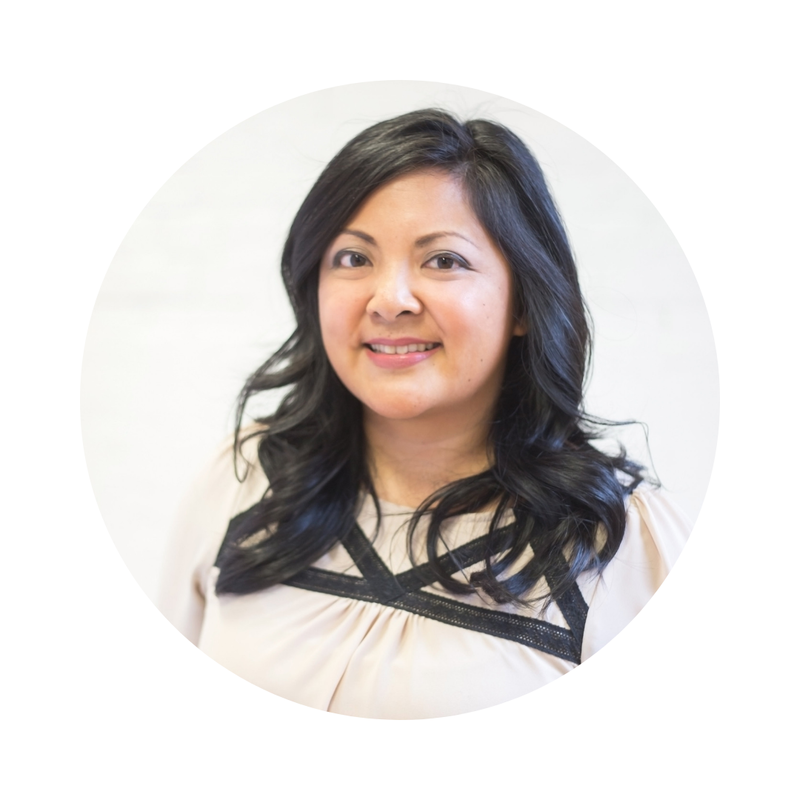 Welcome and thank you Jessie! You're too kind Tara :) And yes, we are enjoying every minute in it! The large pillows on the sofa were from HomeSense and the rectangular yellow one was from West Elm. Happy to help Jenn. You can reach me at ramblingrenovators@gmail.com. You just knocked my socks right off my feet!! Wow, this is one gorgeous room! You guys did an amazing job putting it all together, I know how much longer a project can take with a little one helping out:) I have to go back and look at the pictures again. looks amazing! Congrats on the finished room! 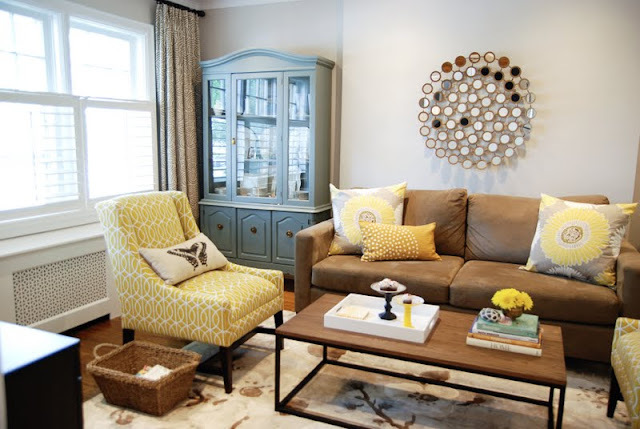 I love those yellow chairs, they make the room look so fresh! And the butterfly pillow..awww. You really did a great job there, congrats! I LOVE the fire place you added, and those chairs are incredible! The Momofuku Milk Bar sounds like a great place. Thanks for the cookie recipe. for these great before and after photos of the living room. The tile on the fireplace looks wonderful. AHhhh! I LOVE IT! You guys did an incredible job! I cannot believe it's taken me this long to get around to reading this post... it's just been one of those weeks and I've fallen so far behind on my blog reading! Great work you guys! Love, love, love those chairs!!! Well done Jen! WOW! That happened fast, right? And everything is all co-ordinated and styled too! I never get around to doing that last 10%...but you went for 110% Good jobbie! Wow, it all looks so wonderful. I love all the colors. Is that Robert Allen for Dwell Studio fabric on the chairs...love! I also love the picture of your daughter. It's so personal and yet really artistic. The first thing I noticed about the chair is the shape. Its transitional, with the wood base but a bit modern too with the sloped arms. And its so comfortable!! I can imagine keeping this chair for years and years. I think the fabric has a classic pattern that will look good for a long time. You can tone it down with solid toss pillows or a solid throw. The piece is pretty versatile - it would look just as good as an accent chair in a bedroom as it does in a living room. 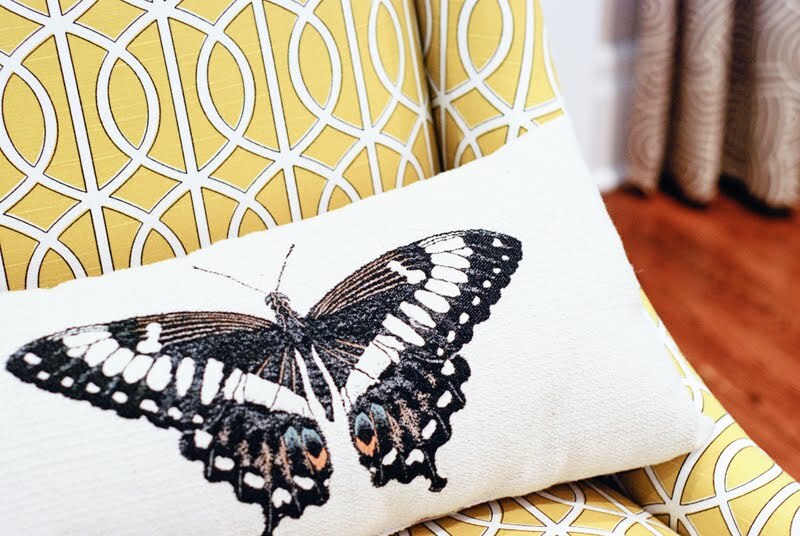 You can always get the chair recovered with new fabric if you tire of it down the road; the shape of the chair is classic and won't look trendy. Thank you! The chairs are the Chloe chair from Crate & Barrel. I got the coffee table at Urban Barn. It doesn't appear on their website any longer but you could call your local store and see if they have any in stock. Sorry, I don't recall the model name. Wow....speechless here! It looks so incredible~ I love the color combos and all the details, you are amazing! Wow! Looks fabulous Jen- What a transformation- the yellow is such a great colour for a front family room and really carries through nicely from the dining room. 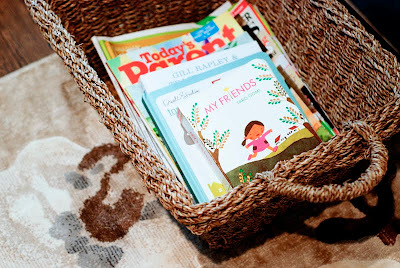 The rustic and vintage touches really allow the room to stay family friendly but very sophisticated! Thanks for noticing! I didn't want the TV to be so visible or take centre stage. We may move the TV to the basement eventually and just have this as a sitting room so it was important that the room wasn't centred around the TV. Thanks Lisa! I love that little red chair too. Yes, I took the photos. The detail shots were taken with my Nikon 50MM/1.8 lens. Its my favourite lens, a magic lens which always takes great photos. Um, I'm not sure how many yards were used? I had the curtains custom made by Tonic Living to fit my windows (142" wide x 89" high, 1.5x fullness). What about wall-mounted lighting or track lighting? They can both work in defining areas or highlighting art. I agree with everyone: the room is lovely! 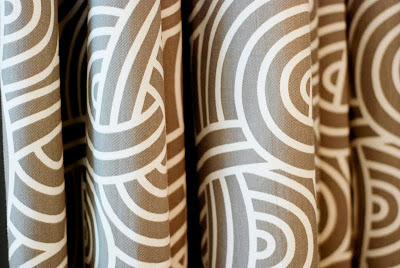 The colors, patterns, textures - they all flow so well from room to room. I especially like the mixture of natural elements (the seashells in the display case, the floral notes in the rug and pillows) with the stronger, geometrical textiles (in the curtains,and beloved Chloe chairs). Great mix. Inspiring, as always. It looks stunning. You did an amazing job and the two rooms look fantastic together. Stunning! You really did an amazing job. I love every element, including your space planning. I've been thinking of finding a similar vintage hutch to spray for our living room, but was worried it would take up too much space. You've just inspired me to start hunting around. Enjoy every minute of relaxing with your family in this beautiful, bright and stylish space. Absolutely beautiful as usual Jen! I love how it turned out and like everyone said it was well worth the wait. 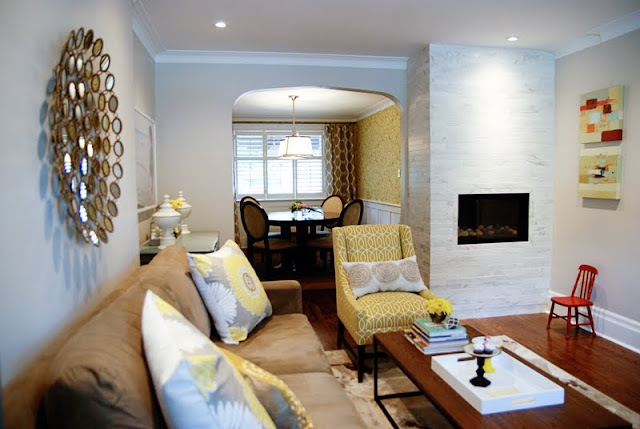 The connection with the yellow pattern between the living room and wallpaper is perfect. Not too matchy matchy but still tying together visually. Perfect. Keep up the good work! Wow! Very nice work! So inviting and what a difference!! This room is just perfect in every way! 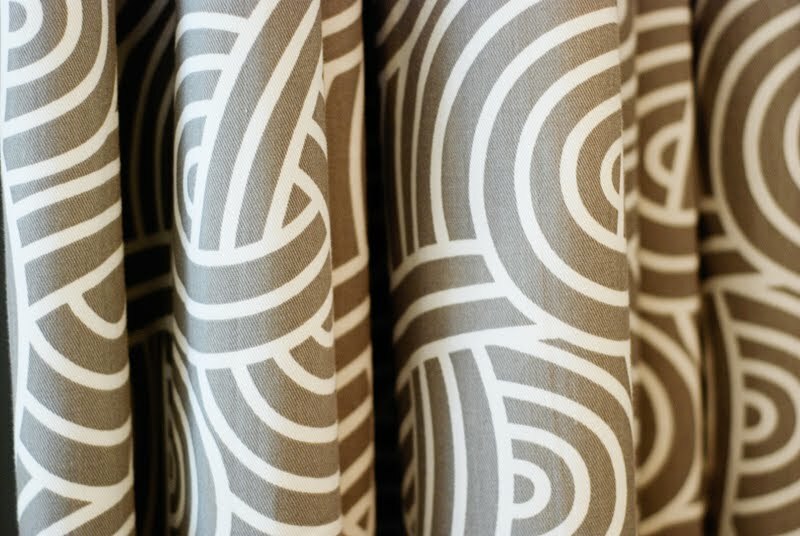 Your really know how to nail the details and are a master of mixing patterns. I love that Dwell fabric and the two painted pieces are incredible. 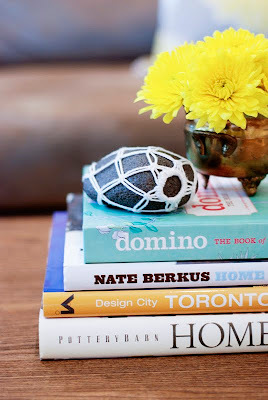 You could do a whole post on the process of styling a room because it looks magazine ready. Jen, it looks AMAZING. What a great makeover. Seriously. It's so light and bright and beautiful. I especially love the painted storage pieces. You are an inspiration. Wow that looks incredible! All your efforts have really paid off. gorgeous! this room is so happy! great job! Love this! 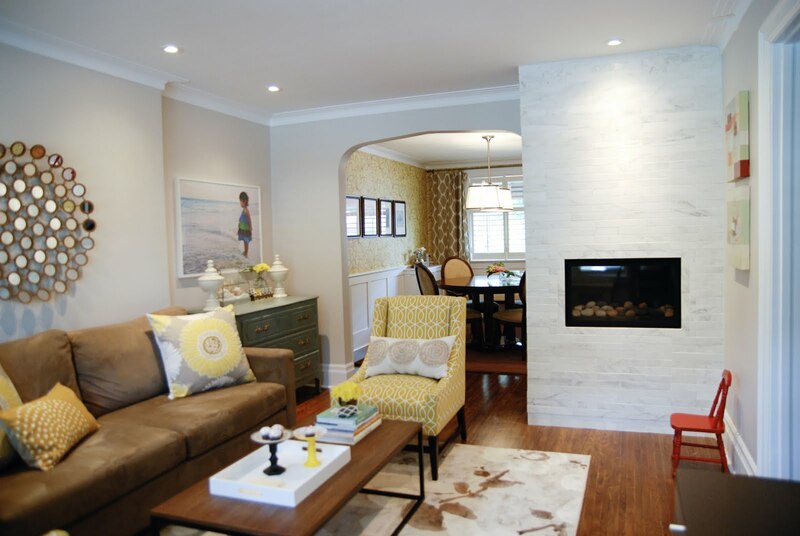 It looks absolutely stunning Jennifer ;) The colour palette, those painted cabinets and yellow chairs, the fireplace....ahhhh! Speechless! Gorgeous! Just gorgeous! It was well worth the wait. So amazing! The room manages to look styled while still being interesting, comfortable and lived in. (The holy design trinity.) I love every bit of it, but my heart belongs to those chairs! Great work! I love it!! it looks beautiful and the colour scheme it great! you did a wonderful job. Oh no, you are not going to believe this. I just checked the urbanbarn.com website and it looks like the coffee table is no longer being sold. I knew there must have been a reason it was on sale when we bought it a few weeks ago :( I don't even have the name of the table, but if you called your local Urban Barn and described it, they may be able to see if there is still one in stock for you? Sorry! Such a fantastic transformation! I love that you've added color through your painted wood pieces, but kept them from overtaking the room. Those yellow chairs are superstars!!! The chairs are the Chloe chair from Crate & Barrel. And if you were here, I'd say come on over! Aren't they? They worked so well with the dining room wallpaper and plus my daughter's name is Chloe so I HAD to get them :) The chairs are the Chloe chair from Crate & Barrel. Absolutely gorgeous. I love all the pops of color. It's fantastic. It is beautiful but looks comfortable as well. I love it! You should be very proud! Enjoy the room! Fantastic choices!! It looks really great! Nice job! What a pretty space. I love your mix of patterns and colours! Fabulous! Just perfect. I also love the shutters and am thinking of doing something similiar in my living room. Enjoy! Oh my goodness...soooo excited to see this. I love love how it turned out - the colours are perfect with your living room. I adore the grey pieces on either side of the sofa and that blown up photo of Chloe is perfection...absolutely my favourite thing in the room. Gorgeous!!! The chest painted in a dark grayish-blue is my favorite part (along with the beautiful image above it!) Beautiful! Looks lovely! I sure like how you use those patterns to create texture and put them all together so well! Gorgeous! And I'm mad for the mirror too! It looks beautiful. I love the yellow chairs. Enjoy! Looks Great!! 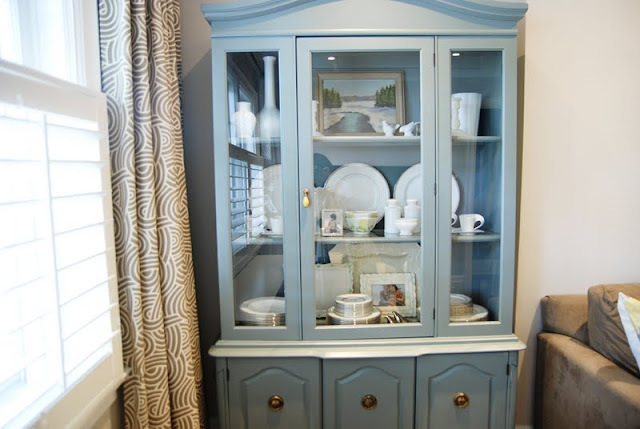 Love the chairs and hutch you painted! Love love love the room! tell me about your radiator cover - did you make it? I'm trying to find a material similar to the front - a "punched-out screen design" for a cover for our whole-house attic fan. you used exactly what i'm trying to find!